Red jacquard brocade luxury wedding suit with dark beards trimming on mandarin collar. 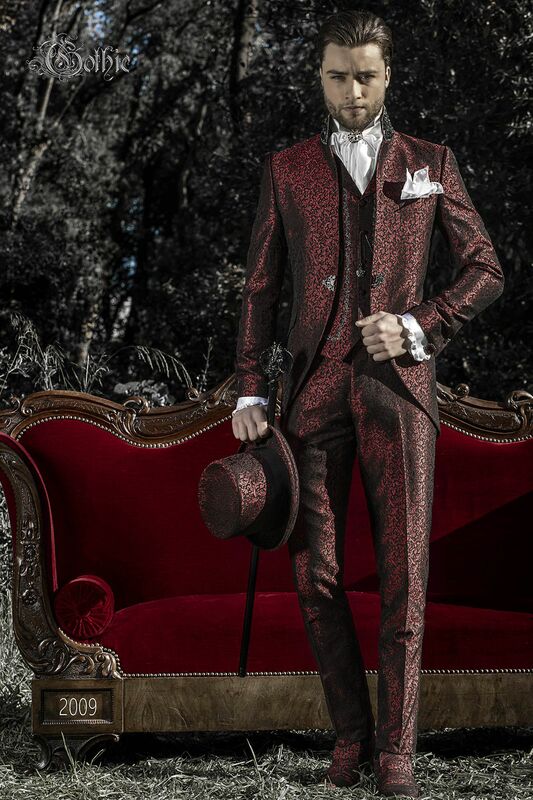 This model is tipically used by t... Red jacquard brocade luxury wedding suit with dark beards trimming on mandarin collar. This model is tipically used by the groom as it has Redingote-style seams on the back, too much formal and elegant for any other guest of the ceremony. Lenght of jacket is suitable also for overweight men or men with hips larger than shoulders. Another precious detail is the single rhinestone frog closure for a groom who wants to look like a prince. Red brocade waistcoat with vintage Baroque lapel. 5 covered tonal buttons and 2 double welt pockets. Black and Silver fl... Red brocade waistcoat with vintage Baroque lapel. 5 covered tonal buttons and 2 double welt pockets. Black and Silver floral embroidery on the front and back lining with elastic band to adjust width. White satin shirt with Beethoven collar and covered button arrangement. Convertible cuffs with patterned buttons and ruf... White satin shirt with Beethoven collar and covered button arrangement. Convertible cuffs with patterned buttons and ruffles on cuffs and placket. White satin Plastron Tie and Handkerchief Set Handmade. Black coated beechwood cane with gunmetal grey dragon knob with smoky grey diamante embellishment. Baroque-style gunmetal grey rectangular cufflinks with red jewel and diamante embellishment. Nickel-tone crown cravat clasp with red rhinestones. Gunmetal grey chain with crown pendant and smoky grey diamante embellishment.